We’ve thrown everything you know about all-inclusive at the Hard Rock Hotel & Casino Punta Cana, and created a luxurious, unapologetic room experience to fit even the most discriminating tastes. Spacious. Indulgent. Decadent. From the moment you enter, you’ll immediately notice rock star touches like private balconies, Hydro Spa Tub, dual showers, plush bathrobes and slippers, and even your own liquor dispenser. From the music playing when you arrive in the evening to turn-down service before you call it a night, we’ve put major attention into every minor detail to ensure your Hard Rock vacation is worthy of a superstar. Several pools to choose from, the beach, the casino, and nighttime fun! 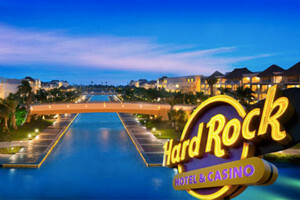 To Learn More Click the “Hard Rock Hotel Punta Cana” Logo.